On Friday, August 4th, Jade Cicada, Detox Unit, Keota, and Shadow Tricks take over the Knitting Factory in Brooklyn, NY, for Lights Out NYC 003 - Jade Cicada, brought to you by Good Looks Collective. Thus far, each LightsOut has strived to amplify levels of excitement and engagement amongst concert goers, and has consistently brought a much needed, refreshing vibe to the electronic music collective in and around NYC. We had the opportunity to query Skyler Golden, the man behind the arthropod, a bit about his thoughts on pushing his musical endeavors forward. We also had a chance to sit down with Blake Oakes - Skyler’s manager and the creative mind behind the LightsOut series. The Rust: What other mediums of art interest you? Do you practice any art form other than music? I’d say movies/tv shows and video games (the soundtracks and sound effects) interest me the most. I’m intrigued by all forms of art but those are definitely the ones I gravitate to for inspiration. I was never really one to be inspired by a piece of still art or anything, but I think it would be something worth trying out some time. I have a ton of respect and admiration for illustrators and graphic designers because I’m pretty useless in that category haha. Guys like Beeple and FuniLab and Kilian Eng are a few examples of still art artists that I really admire. I mess around with illustrator and photoshop from time to time (that’s how I made my logo and font) but that’s more of a hobby. The Rust: What are some non-musical influences that have shaped your musical direction + musical career? The Rust: What kind of capabilities would you like to program into your live sets in the future? Do you have a particular vision for how you would like to present/perform your music? I’m relatively inexperienced when it comes to live performace. I’ve only been doing this about 2 years and I’ve only done about 50 shows. Right now I’m just trying to get really good at constructing great sets. I think I’m getting better at it and like to think each show I do is better than the last. In terms of the future, I’m planning on incorporating stem mixing to some degree in my sets, and possibly even controlling my own visuals. These things take a lot of time, especially on top of trying to produce new music, so don’t expect to see any of that soon, but it’s definitely a goal of mine. The Rust: Are there particular styles/soundscapes you would like to pursue musically other than your current direction? It’s not a popular one, but I love ambient music. Tipper’s sunrise set at his festival in Suwannee was my favorite set of the weekend and I’d love to explore that style of music more. I’d love to see my peers explore that style more as well. I think we all need a break from slamming kicks and snares from time to time and just focus on the atmosphere and textures possible in more mellow music. The only problem is that the average listener falls asleep to this stuff and nobody dances to it haha. It’s definitely an underappreciated artform that has so much room for experimentation and development. I’d also love to mess with some more “IDM” style stuff, but damn that drum programming can be such a pain haha. The Rust: Do you have a concept in mind for a full Jade Cicada Production? Anything you might be particular towards in curating the best rendition of a Jade Cicada concert? Not really a concept, just some ideas. The thing I care most about now is playing shows with good speakers (Funktion One, Hennessey Sound Design, Danley Sound Labs, etc), and playing venues that are acoustically treated properly. Sound is everything to me, and I want my listeners to hear my music the same way I hear it in my studio. I think the obvious things like some dedicated notable live projection visual artists would be great. I love Amon Tobin’s ISAM 2.0 stage setup. Something like that might be really cool but if/when that happens is questionable. I think what we did in Atlanta was a good starting point in terms of visual mapping, projection, and stage construction, but a solidified concept is a little ways down the road. The Rust: So, can you tell us a little bit about the idea behind Lights Out, and what inspired it? The inspiration to the concept of LightsOut i guess was inspired by the whole UK dubstep “basement vibe” in the mid to late 2000s. Packed rooms, A lot of dancing bodies, and big Sound Systems. At that time digital culture was not so present. So taking phones away was not really “something” that grabs your attention. In the end that’s what that concept derives from - we want your full attention and attendance. I think adding this aspect really allows you to disconnect and actually BE PRESENT at the event. Shout out to Yondr. The Rust: Do you have intentions to bring this concept to other locations (cities, states), provided there is enough interest? 100% interested. Right now I am really focused on Atlanta & New York and getting the concept nailed down. but in the near future - Most definitely, yes. The Rust: Is this the full iteration of your concept currently, or do you have further ideas you’d like to implement to the experience as the opportunity presents itself? I think there are plenty ways to build on the LightsOut concept. Creating a real vibe in the room is something i want to work on. I do not think it has to be completely blacked out either so there are plenty of ideas to really get that across. I’ve got plenty more to work on. The Rust: Do you feel there are particular styles and directions of music that the Lights Out concept works best with? What other artists/styles of music would you like to be able to showcase through this medium in the future? Absolutely, I think doing the Jade Cicada LightsOut really kinda shows that the concept can be represented by multiple styles. In the end, that’s what the concept is derived from. A focus on sound. I think the music just has to be really dope, and sound even better on a really dope Sound System. If you’re worried about the fidelity of the sound, ease yourself to the tune of a full Hennessy sound system; a veritable beast, capable of projecting all frequency ranges with top of the line clarity and ferocity. 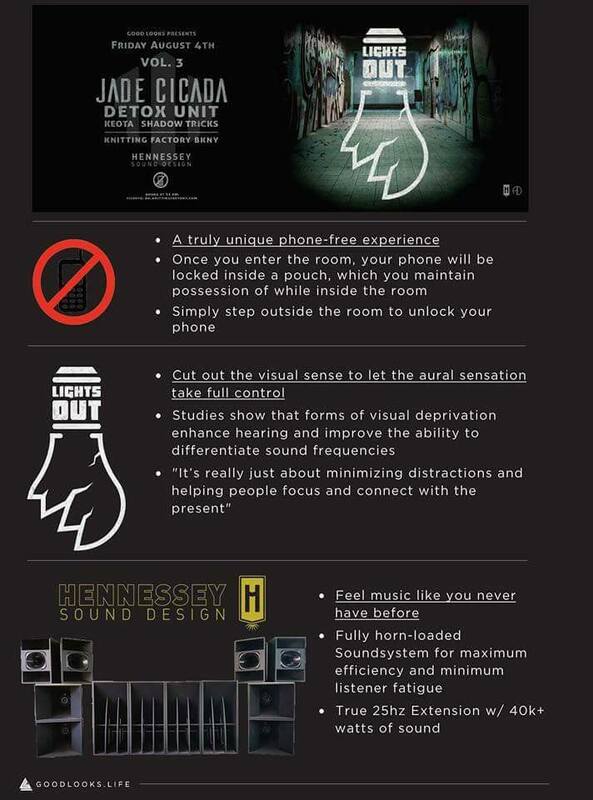 If you’re worried about the “no cellphone policy”, also relax; the entire experience is designed to help immerse and integrate the listener fully, removing all distractions so as to maximize your aural sensitivity. Make sure to hit up the venue as early as can be, as Keota, Shadow Tricks, and Detox unit are slated to bring their own killer tastes to the table and help curate an excellent party, top to bottom. To everyone making the trek this weekend: I’ll see you in there. Purchase tickets to LightsOut here.